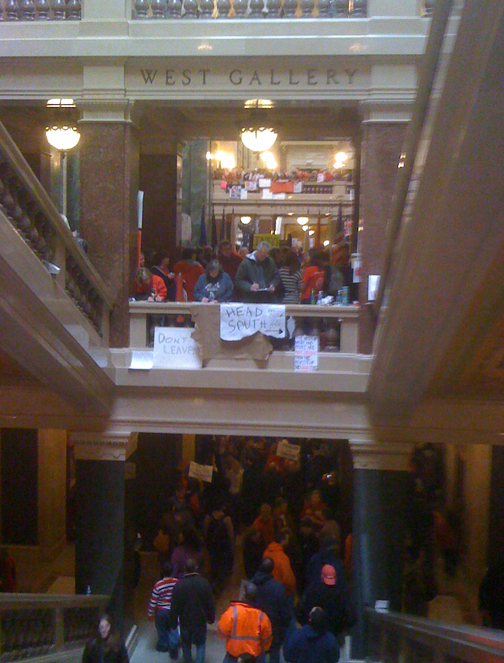 Back in Brooklyn now, but I did want to tie up a few loose ends and post some pix from yesterday’s scene at the Wisconsin State Capitol. First, a couple of comments, then some pix. It looks like much of the Wisconsin budget shortfall came from some spending initiatives and tax breaks pushed through by Walker and the Republican-dominated legislature: an economic development fund, health savings accounts, and tax breaks for employers. In any case, what Walker sees as a $137 million deficit, and the state’s independent fiscal auditor sees as a $56 million surplus (here), is pretty small change in a budget of over $13 billion—hardly the justification of action this drastic. I had a couple of conversations with Joel Rogers, a professor of law, political science, public affairs, and sociology at the University of Wisconsin. To outsiders, it’s mysterious that the same state could have spawned Joe McCarthy and Robert LaFolette, or Scott Walker and Russ Feingold. Rogers explained that politics in Wisconsin has historically been driven by an alliance of industrial workers and capital-intensive dairy farmers on the left, opposed on the right by a mainly Catholic rural population. They’re pretty evenly divided, thus the contrasting figures and tight elections. Rogers also sees Walker’s attack on the public employee unions as part of a nationally coordinated Republican strategy to remove the unions as major financial and organizational supports for Democratic candidates. Some of the wavering Republican legislators in Madison got calls from Karl Rove and people speaking on his behalf. Such is politics in the USA (and this is me speaking, not Rogers) that the unions have a choice only between supporting a party that does little for them when in office and one that would destroy them. There was lots of commentary on how Gov. Scott Walker dropped out of college—Marquette, to be precise—where he’d had a C average. 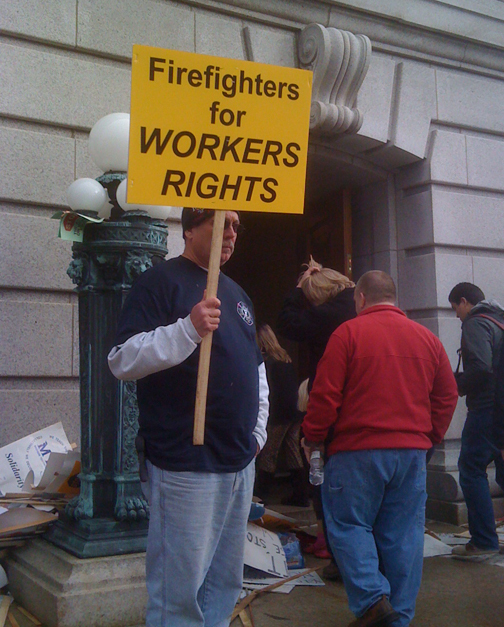 Walker’s bill to strip most public employees of collective bargaining rights exempts police and firefighters—a “thank you,” you might guess, to the endorsements of his campaign that came from the unions representing state troopers as well as Milwaukee’s cops and firefighters. So there was much cheering when a number of firefighters came out in support of the demonstrators. 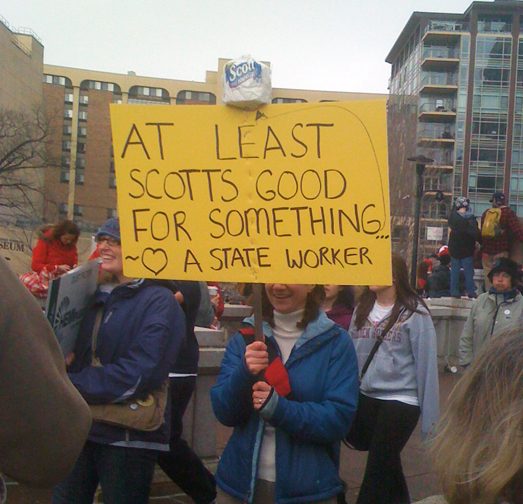 Support came from a number of private sector unions, too. 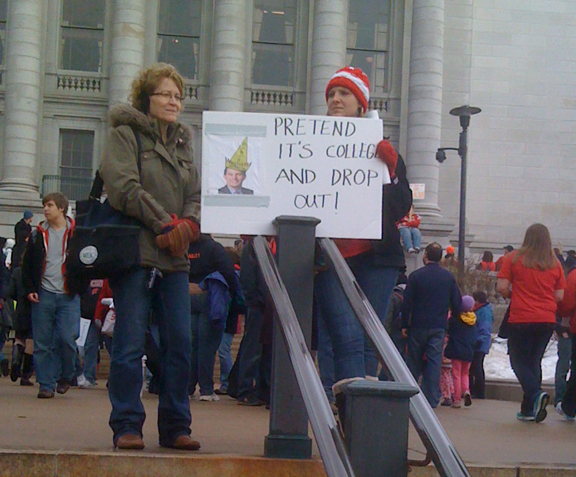 In stark contrast with your modern style of demonstration, in which cops keep demonstrators far from their intended targets, once again, protesters were all over the Capitol. This was the only visible evidence of support for Walker—two signs on a house next to our hotel. That was it—no gaggle of counter-demonstrators holding placards in defense of “taxpayer rights” or any such nonsense. The night before, someone in the house was practicing some rock ’n’ roll drumming inside. Must have been some sort of Ted Nugent-style libertarian. “Rogers also sees Walker’s attack on the public employee unions as part of a nationally coordinated Republican strategy to remove the unions as major financial and organizational supports for Democratic candidates.” – That’s not entirely untrue, but it seems to let Democrats off the hook. Obama and Arne Duncan and viciously deceptive films like “Waiting for Superman” (made by Al Gore’s buddy) have been attacking teachers and their unions for quite some time. The other reliable leftish anchor of US politics, besides public sector unions – the Black population – has also been pulverized by the Obamabots and the Black Royal Family as a recent article in Black Agenda Report points out. Democrats have been doing their damnedest to destroy any popular social-democratic resistance to neoliberalism. But the “defunding” strategy by the GOP makes some sense. It’s also why the GOP is highlighting its support for Israel, center-staging its hatred of Muslims and whispering suspicions that Obama is a crypto-Muslim, promoting the career of the only GOP Jew in Congress Eric Cantor, and – as per the memo – redefining America from a Christian nation to a, heh heh, “Judeo-Christian” nation. Center and center-left Jews give an enormous amount of money to the Democrats… and the GOP would love to shut that down. But the Dems bring it on themselves. As for shooting yourself in the foot, remember that Bill Clinton pushed for ever-greater rates of incarceration, while being warned that such a move would essentially destroy the Black and Latino/a voting base of the Democratic Party, including removing hundreds of thousands from the franchise. Democrats don’t care: they’re not Market-Leninists Gotta-Have-It-All like the GOP. Democrats are the enabling, legitimizing, and clean-up-let’s-get-along party, not the bourgeois vanguard party. Different roles: same plot. All in all, I don’t care what plans the GOP and Dems have for each other. That’s a fight between sockpuppets. Don’t kid yourself: those 14 Democratic state senators weren’t fleeing Governor Walker… they were fleeing the protesters and what would have happened had they decided to take their seats for a vote in the Capitol. Joel Rogers is a little off, perhaps because he conflates all Christians into one monolithic, political bloc. As with most of the United States, Catholic religious affiliation in Wisconsin has declined dramatically over the past 30 years. As of 2008, only 28% of Wisconsin residents identify as Catholic, while close to 55% now identify as Protestant. 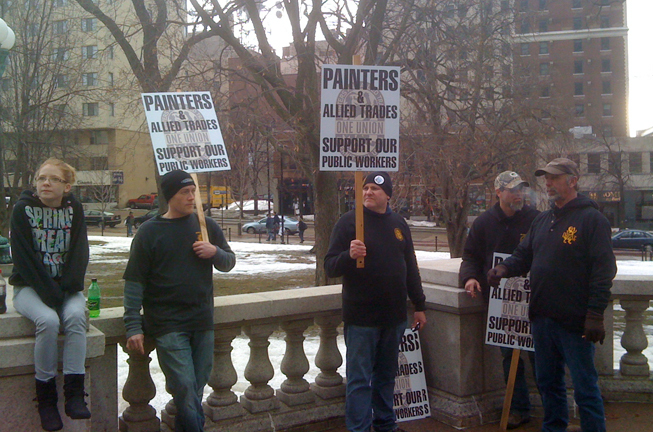 Interesting to see how the face off will evolve between Tea Partiers and union folks in Madison “late Weimar,” WI. In NJ, Gov. Christy will attempt a different strategy with teachers. One plan will try to get older teachers to retire by offering to pay med benefits if they retire, but force them to bear most of the cost of health insurance if they keep working (a new type of retirement “incentive”). Great stuff as usual Doug. This is a massive issue, the Taft-Hartley-like moment for our generation. Would you be interesting in linking the blog for our radio show, the Illinois World Labor Hour, here at LBO News? We have you up at our blog. Many thanks, and keep up the great work.